Flashcards+ is the top flashcard app in the app store — ranked #1 for flashcards! Memorize like a pro with Flashcards+ by Chegg, the fast, fun, free flashcard maker designed to help you learn things more quickly and ace your toughest classes. This is the ultimate online flashcard & notecard tool for high school and college students, and those studying hard for the SAT, ACT, GRE and other standardized tests. With Flashcards+ you can study anywhere, and any time — review your math flashcards while you’re waiting for the bus, study Spanish flashcards on the way to a big test, or cram for chemistry when you’re walking across campus. What makes Flashcards+ the top flashcard app? - Make your own flashcard decks for SAT, ACT, AP, vocab, math, spanish, biology, anatomy, chemistry & more! 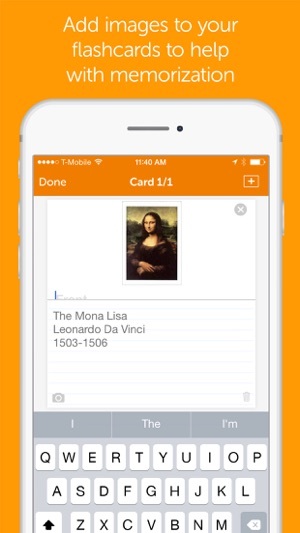 - Go beyond text-only flashcards and add images. Think chemistry formulas for organic chemistry, paintings for an art history class, anatomy diagrams for biology … anything you need to memorize quickly. - Don’t want to create your own? Download flashcard decks made by other students on Cram.com. 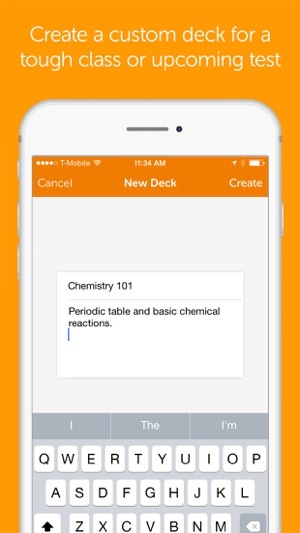 - Share your decks with friends so you can study & learn together — free for everyone! - Keep track of the cards you've learned & save time by only studying those you haven’t mastered. 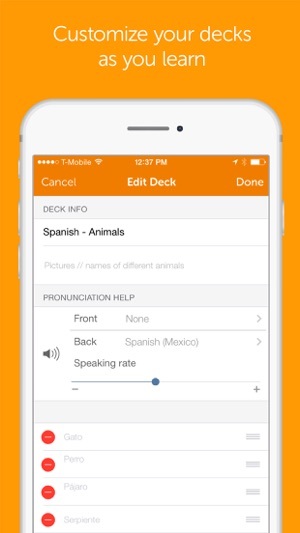 - Make flashcards in 22 languages with support for pronunciation, dialect & speech speed: Latin, Spanish, German, French & more! - Shuffle your decks to stay on your toes and filter & search decks to find specific note cards. 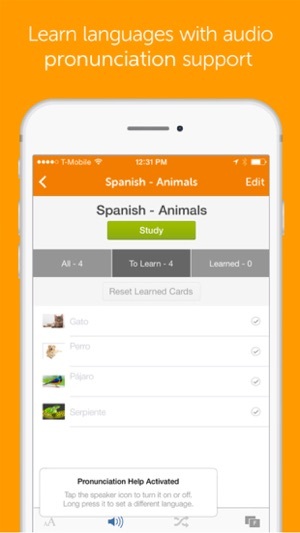 - Backup & study your flashcards for free across all your iOS devices. I use Chegg a lot, it’s super helpful. They do make some UI choices that confuse me though. Like, personally it’d be nice if my decks were tied to my account rather than my phone, especially with the whole syncing option; for instance, I have a personal email that I would like to use for just personal projects and random stuff I want to study, and then I have a school email that I’d like to use for just my classes. But as it is, if you log out of an account and try to make a new account, all your decks stay the same and get synced onto the new account. And any changes you make to one account will be changed in the other when you switch back, because it’s the same phone. It’s not a huge deal, but it’d just be nice to have the option of keeping separate accounts. Then some other smaller things, like you can’t make a category until you have decks to put in it. For instance when I start taking Chinese classes I would rather just make a category named “Chinese” and start making decks in there directly rather than have a random deck named “vocab day 1” floating around that I have to make and then find in my list when making the category. Or when I delete the deck and have to start the whole process over again because the category no longer has a deck in it. Again, not a huge deal, just kind of annoying and unnecessary. But again, this app has been very useful to me. Thanks for all you have done to up my gpa. I’ll tell you all why and that is that after some time Apps at the App store no-longer work, are compatible or the developer forgets about it because they can no-longer afford it. This brings me to a point in this App that needs to be in the next update and that is the ability to share, save and/or print the cards made. Why? Simple if the App no-longer works all the cards made will be lost. If the cards can be saved or printed so an index card file can be created the process of studying can still be accessible even if the developer loses the App. At this point in-order to share or keep the cards made the App is needed. Printing would be a major plus. Hi Sparkaline! Thank you so much for providing us with your feedback. We can definitely understand your concerns. Sharing is currently a feature available for the app. 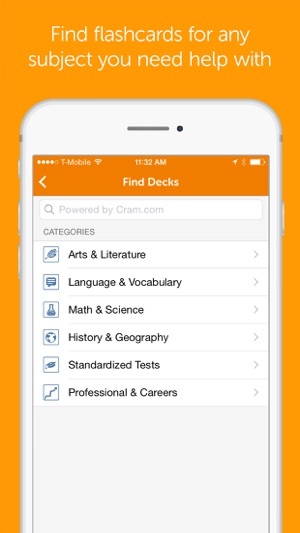 Additionally, if you backup your decks in the app utilizing a Chegg.com account, then your content will be synced across your Apple devices. We can absolutely look into adding a printing function, though, in an upcoming release. Please don't hesitate to email us at appfeedback@chegg.com if there are any further features that you'd like us to add. We just ask that you include "iTunes Review Follow Up" in your email's subject line if you do decide to message us. Thank you again for your insight! It’s hard to get me to love an app, I usually only like it, but you know, it’s not always the best. This app, though, is wonderful! It has features such as audio, which really helped me with my language. It’s great for other, things, too, like just regular academic subjects. There are folders, and you can put a whole lot of decks into that folder! I highly recommend getting this app, especially since all of the good features, like audio, are free! My experience with this app has been great so far, and I hope I can continue saying that throughout the years!! One thing that I can say that is a problem for me is that I haven’t found a way to print my cards out, or share to another device that’s not an iOS device. I would really appreciate it in the future, and it would help so, so much, and that’s the only reason I’m rating this a 4 star. Thanks again for making this app!